I have really enjoyed reading your blog. My first auto was a 1911 Norinco. At the time, that was a huge amount of money. I could've had a 9mm, but the .45 was a dream I've had since childhood. I've fallen in love with them. My wife calls it fondling, but I love to work with my pistols. I'm following you on the 1991 Compact. Lost my Officers Series 80 to my daughter when she turned 21. She asked for it when she was 10. Couldn't say no! Replaced it with the Compact. Thanks for the quality blog and good advice. Adios. Great advice. 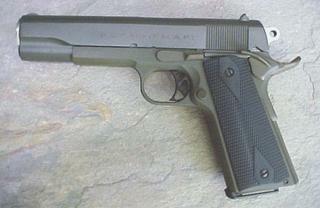 Besides those already mentioned Dan Wesson is not a bad way to go for a high quality 1911 for a good price. Just a thought. I love reading your 1911 posts, I think most people that have been around 1911s intimately for a few years, tend to come to similar opinions. 1-I still have a hard time keeping it around 2" @ 25yds WITHOUT the "stress factor",..LOL. 2-I preffer a smooth but heavier 4.5-5.5lb. carry trigger due to "stress factor" safety. 3-I don't like extended safeties of anykind, G.I. safeties work great for my carry guns. 4-I'm not sure why you like a "high ejection port", I like them lowered (within reason). I agree with you 100% on everything else, I too chose Colts to tinker on, as an ex tool & die machinist I can tell you, the bar stock and forgings they have used over the years for major parts like the frame and slide are high quality and superior to most other brands, even if their dimensional specs sometimes do need a little tweeking for better accuracy. 1911 is far from the only thing you'll ever need. If this was so then the U.S. Military would not have retired it as a general issue sidearm for servicemen. It's hard to argue with people who have a unwavering passion for the 1911 because for them it IS the best pistol and you can't argue with personal preferences. There's no denying that a finely tuned 1911 (and finely tuned is much different from the old 1911 service pistols) dominates many shooting competitions. However, for modern military, law enforcement, CCW, and self-defence there are many other choices that are arguably more reliable, more comfortable as a sidearm, and easier to deploy than the 1911. Not doubt, though, that the 1911 is a classic that has a special place in the history of firearms that cannot be dethroned.